Maechee Arun grew up in a family of seven sisters and brothers, and studied up to the high school level, while working on her family’s farm. 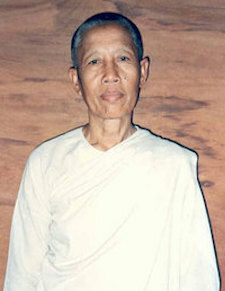 In 1959 she began to study the Dhamma, and ordained as a Maechee in order to learn further about the Buddha’s teachings. She specialized in Vinaya and Abhidhamma. Maechee Arun has dedicated her life to promoting the status of Maechees in Thailand , and served as the Secretary of the Thai Maechee Institute from 1981 – 1993. She helped establish centers for Maechees in Pasang and Nakhon Sawan in the north; Nongbua-lampu and Petchaboon in the northeast; U-tapow and Rayong in the east; and Rajburi, Petburi, Hua-Hin and Supanburi in central Thailand. Maechee Arun organized and led Tu-dong practices for the King’s 60th birthday. 134 people walked for 5 days from Paktow (Rajburi) to Buddha-monthon (Nakhon Pathom). For the Queen’s 60th birthday, she organized a tu-dong practice of 60 people who walked for 9 days from Pasang to the top of Doin Suthep mountain in Chiangmai. Maechee Arun was the editor of the Thai Maechee Journal from 1984-1994, and has been an invited guest speaker for many projects to support Buddhist women up to the present. Maechee Arun is known for being earnest and sincere.